A couple days ago I shared my favorite mashed potato as of late. Well, these sweet potatoes take on a similar technique but made with the sweet tooth in mind. Preparing these sweet potatoes is similar to the Creamy Chive Mashed Potatoes because it uses butter, cream cheese and half & half. The difference is that this also incorporates pure maple syrup for that sweetness. As for the candied pecan topping, it couldn't be easier to make. 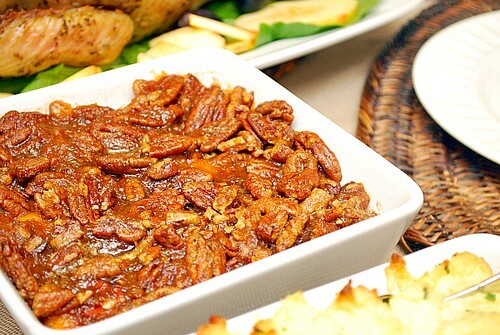 Whole pecans are tossed with dark brown sugar, an egg white and a pinch of salt. Feel free to add more spices like cinnamon and nutmeg if you'd like but I love it all on its own. Place the topping over the mashed sweet potatoes and bake. Now how easy was that?! Peel and cut the potatoes into pieces that are generally the same size. Bring a large pot of water to a simmer and add the potatoes. Bring to a boil and cook for 30 to 35 minutes or until soft enough to easily poke with a fork. Drain the potatoes in a large colander and return to the empty pot. Place over low heat and mash the potatoes until any liquid/water has evaporated. Remove the pot from stove and add 2 sticks of butter, cream cheese, warmed half & half and maple syrup to the mashed potatoes. Continue mashing until fully incorporated. Transfer the mixture to an oven-proof 9x13 serving dish and top with slices of the remaining butter. Combine the ingredients for the topping. Place the pecan mixture over the sweet potatoes. Bake in the preheated oven until the pecans are toasted and crisp, 10 to 15 minutes. Serve immediately. 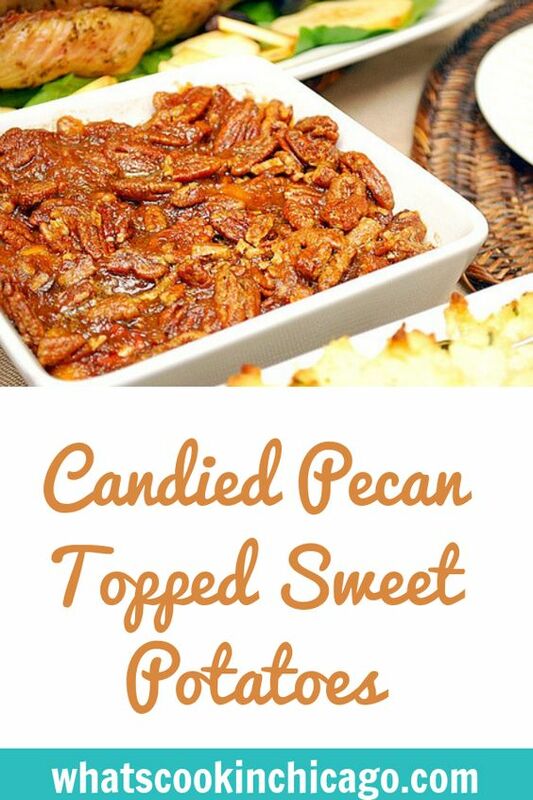 Oh man, look at those big candied pecans on top. These sound awesome. I didn't make sweet potatoes for Thanksgiving, but I think they may need to make an appearance in one of the coming weeks.